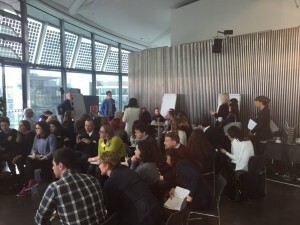 The second London Cultural Tourism workshop took place March 7th at City Hall in London. I was asked to facilitate the day by a great team including Creative Tourist and Mike Clewley from Greater London Authority office. 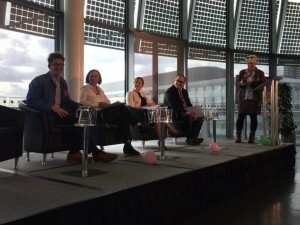 The original idea was a traditional type of day – speakers, delegates listening and time for Q&A. However, the more we talked it was clear this wasn’t the right framework. The day needed to be a hybrid of speakers and time for delegates to speak – not just ask questions. The format was an awesome Keynote from You Me Bum Bum Train (whose name I spent ages trying to say without laughing) followed by a 4 person panel with each speaker speaking for 2-minutes (and yes, I did time it and glare if they went over) then breakout sessions that were run as an unconference. A LOT was going on but I’m a firm believer in creativity comes in all paces. The breakout sessions were great to observe. Asking people to pick up their chairs and move them to the session they wanted to attend pushed some people out of their comfort zone (which is always a good thing in my book!). Many didn’t understand the concept but I explained (repeatedly) that they control their outcome for the day so no excuses to leave feeling they didn’t gain anything. They knew they had ‘permission’ to leave conversations they weren’t getting anything out of and to start conversations that weren’t being talked about yet. It was a big ask. Creative Tourist worked closely with the speakers before the event to ensure they knew their role was NOT to lead or do all the talking/discussing but to listen and let others know they had the platform to discuss issues hopefully related but not always. In other words, the speakers were NOT in the spotlight. It was awkward for the delegates but they soon got into the spirit of things (with huge thanks to Helen Palmer, Andrew Palmer and Alex Saint for ensuring this happened with each breakout session). Each breakout session also had a students studying for a MA Cultural Policy and Tourism from Goldsmiths, University who were live Tweeting and Instagramming for us. See see their awesome work, check out this Storify. 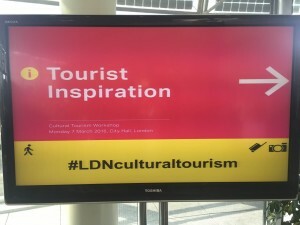 Keynote – what inspires cultural tourists? Everyone in the group reflects back to their own discussion & can add to the plenary. The first half of the day was complex with all the explaining but by lunch the room was filled with lots of conversations and noise – always a good sign. During lunch it was ‘encouraged’ that everyone meet someone new. It’s vital for any conference to have a networking element but often the delegates themselves don’t know how or what to do at these times. After lunch we had a similar format: speak panel with 2 minutes each to speak then breakout sessions. During lunch another topic, social media, was talked about so in the spirit of the unconference, we added it as a topic. Collaboration: The need for everyone from walking tours, shop owners and national museums to do more collaborating to build a relationship up in communities. Partnerships: Along the same lines but the need for a more established and long lasting relationships that can pull in national and international partnerships. Storytelling: We are constantly talking abut what we have on offer as a marketing ploy rather than looking at the consumers point of view. Get everybody involved, not just the top 20. Listen to what the public wants, not just what we assume they want. Bring YOUR ideas to the table! OWN THIS!